The take-home whitening treatments we offer at Pure Dental Toowoomba allow clients to achieve the same result as more expensive laser whitening treatments, all from the comfort of their own home. Dr Nicola embraces at-home whitening options for clients because they are minimally-invasive, as well as being cost effective. 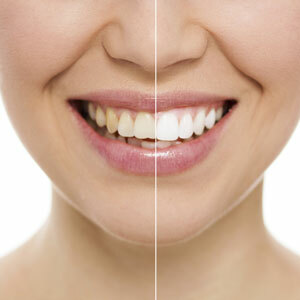 Our whitening treatments are available in both Poladay and Polanight, a safe, convenient, and effective treatment which has been used by trusted oral healthcare professionals for years. Clients can also choose from a variety of product strengths, giving them the option of a whiter, brighter, yet natural-looking smile. Poladay is recommended to those who want to achieve whiter teeth in as little as half an hour each day and is great for those with a busy lifestyle. Polanight, on the other hand, can be applied overnight while you sleep. Both of these treatments are recommended for clients who have more sensitive teeth, as their Pola Desensitising Technology (PDT) works to protect both the nerves and nerve endings in gums. If you’re interested in having Dr Nicola prepare one of these custom teeth whitening trays for you to apply in the comfort of your own home, schedule an appointment with us today!